SAM I am commonly seen with HOCM. No...it is not Dr. Seuss' new cardiology rhyme. SAM is the abbreviation for "systolic anterior motion" of the mitral valve. SAM is the term used to describe when the septal (anterior) mitral valve leaflet is pulled into the left ventricular outflow tract (LVOT) during systole by the enlarged papillary muscles and thickening of the left ventricle, as classically seen with certain types of heart disease (specifically Hypertrophic Cardiomyopathy (HCM). Secondary obstruction of the left ventricular outflow tract (again, LVOT - you'll soon discover that VetGirl is addicted to abbreviations) may worsen LV hypertrophy through additional pressure overload. Systolic anterior motion is often documented on M-mode evaluation of the mitral valve as abnormal movement of the septal leaflet towards the interventricular septum (IVS) in early-midsystole. 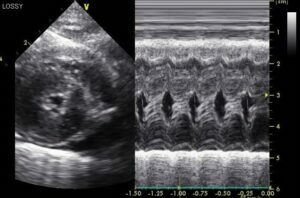 Superimposition of color Doppler to the M-mode interrogation of the mitral valve can document the blood flow turbulence during SAM. The outflow tract obstruction that results is essentially a dynamic subaortic stenosis (SAS) that increases the velocity of blood flow through the subaortic region, resulting in turbulence. Moroever, the abnormal position of the septal leaflet results in a gap in the mitral valve and ultimately mitral regurgitation. This is the likely reason why cats with HCM and SAM have an audile heart murmur. 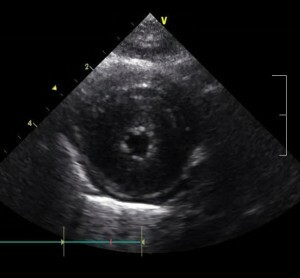 Mitral valve SAM can are identified with echocardiography. Treatment will depend on the degree of cardiac disease, potentially including diuretics such as furosemide, ACE inhibitors (e.g., enalapril), medications for rate control (e.g., beta-blockers like atenolol), or medications to relax the heart (e.g., calcium channel blockers like diltiazem). Ultimately these will be based on clinical signs and diagnostics (bloodwork, thoracic radiorgaphs, and echocardiogram). For more information, check out our podcast on the use of pimobendan in cats... to find out if it's contraindicated with HCM or not! I’m not a vet. I wish I could join. This article helped me understand my cats heart condition so much. Also, to understand his echocardiogram and Doppler. Wish I could learn more. I am loving him and prays he gets better..